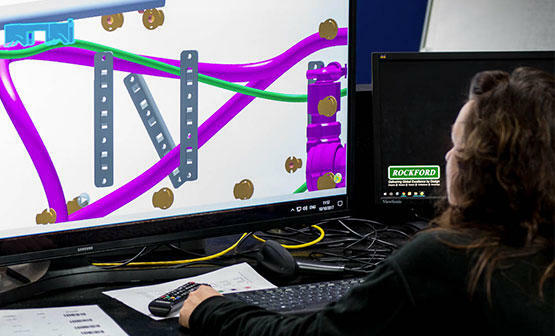 Using a variety of design packages, Rockford’s experienced engineers can design anything from simple assemblies to full systems, and can perform rapid prototyping on these designs. Our in-house engineers work together to build products involving basic harness design, electrical design, electronic design, mechanical design, and software and firmware development. Software used includes HarnWare, AutoCad, AutoCad Inventor, ProEngineer, Microsoft Visio, and SolidWorks. HarnWare outputs 2D manufacturing drawings, and with the use of HarnVis can output a 3D CAD model of the entire harness or individual components. All models can be supplied in various formats to meet customer requirements and drawing formats, and 3D modelling images are exportable into the correct format for your models. With a catalogue of standard part models, Rockford’s design services are competitive and efficient. We use core engineering skills to design for manufacture. Rockford’s experienced design personnel can work with limited information and produce detailed manufacturing drawings quickly and cost effectively.